As discussed a few days back, the Investment Grade (IG) CDX has underperformed High Yield (HY) CDX since the announcement of JPMorgan's recent loss. On a relative basis, investment grade CDX widened faster than HY. That underperformance is also visible when comparing IG CDX spread levels to the US equity markets. Ironically JPMorgan's research (they do excellent work by the way) views this divergence caused by their firm's announcement as a trading opportunity. 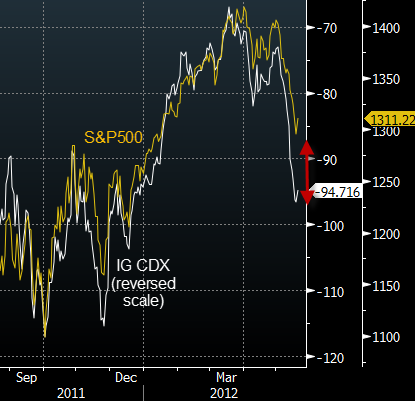 Their scatter chart shows that based on recent levels, SP500 and IG CDX are in fact out of sync. 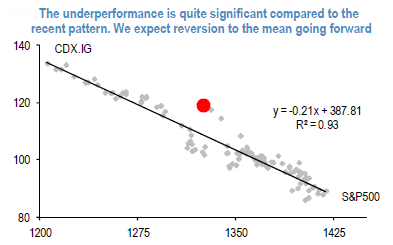 That "reversion to the mean" would help JPMorgan's portfolio, assuming it has not changed directionally since the announcement. The problem with this trade recommendation however is that this IG CDX relative widening may persist for a while. IG's underperformance may be around at least until the market is convinced that JPMorgan's "big unwind" of the CIO book is not imminent. And that may take some time - possibly a couple of quarterly earnings releases or the year-end balance sheet statement from the firm.